Constructed by Ahom king Rudra Singha in 1703 the Namdang Stone Bridge (Namdang Hilo Haku in Assamese) made up of a single stone. This stone bridge on Namdang River was constructed by the craftsmen of Bengal. Later it was brought from there. This bridge is one of the magnificent structures built under the patronage of the Ahom kings. This bridge is thus also famous for its historical importance. Namdang Stone Bridge, built across the Namdang River, a tributary of the Dikhou river, is a massive structure with many culverts and embossed images. Uniqueness is that it is made from a single piece of rock. Namdang is one of the ten stone bridges built by the Ahom kings. The bridge was constructed by the labours brought from Bengal. The bridge has been the target of natural calamities like earthquake and flood. Nevertheless it stands still. Presently the National Highway 37 passes over this stone bridge and proudly taking loads of tonnes of vehicles everyday. The bridge is a testimony of great architectural style of the Ahom kingdom. The bridge is 60 m long (196.85 ft), 6.5 m wide (21.32 ft) and 1.7 m high (5.57 ft). The bridge is a little curved in shape. During the time of the Ahom kings cement was not in use for construction. A paste of rice, eggs, black lentils and lime was used to make the bridge. Sculpture has been cut on the pillars of the bridge. There are many culverts. 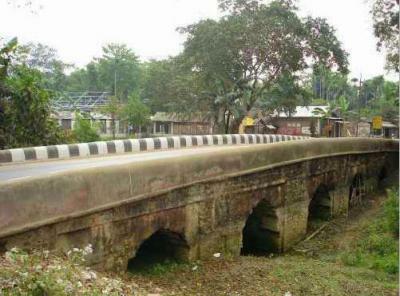 The bridge connects Sibsagar town to Dibrugarh and Tinsukia districts of Assam. One of the major problems facing the bridge is that it is the target of natural calamities like flood. The architectural work of the bridge gets damaged due to flood. By Air : Nearest Airport is Mohanbari airport, Dibrugarh. You can reach Sivasagar by private car or bus. By Train : Nearest station is Sivasagar town station. By Road : It is in NH-37 towrads Jorhat town in Gaurisagr and about 15 Km from the town. For more details about Sivasagar click here.